My mom had my childhood headboard and footboard in her garage and I got them from her recently. This was my childhood bed (here I am in it back then) that my mom and I stripped and refinished at some point when I was a kid. She brought it out when she and my dad moved from Chicago to Portland in 1998. I don't know why I didn't think to ask her about it sooner, but I had kind of forgotten all about it. Sure enough, she still had these pieces; I ordered new hook-on side-rails and a box spring and Andy put it all together for Mimi over the weekend. Mimi was downstairs playing with two gigantic bags of Barbie stuff that I found for free on Nextdoor; our class has been collecting donations for a family of refugees from Syria, and “Barbie house and toys” was on their wish list and I got so lucky to stumble upon these almost immediately after reading the wish list. Mimi knew she would be bringing these to her friend on Monday, and oh my word, no toys have ever been played with as much as those toys that were headed immediately back out the door. She had the best time. Andy and I busied ourselves with taking out the toddler bed and putting together the big bed and washing the curtains and cleaning her room. In the late afternoon, just as we were finishing, she wandered upstairs and saw the new bed and loved it. I mean, she knew it was happening, but it was really fun to have her walk in to it all having been done without her watching the progress. It felt pretty magical. I have always loved this little bed and I don't really have words to describe how sweet it is to see my little daughter excited about getting it for her own. Naturally I am now spending most free time trawling eBay for vintage Laura Ashley bed linens. The Nutcracker was so lovely, as always. I did not take that photo of the dancing snowflakes (I found it online and it is by James McGrew) because they don't let you take pictures in there and I'm always sad because I just want to remember how pretty it is — the snowflakes are my favorite. They do have a photo-op for the kids with some of the younger dancers, all dressed up. Andy bought Mimi the tiara she picked out during intermission. Before we left the house, she found a pink flower headband and put it on, and posed with the two battery candles in front of the Christmas tree. This was all her idea and she asked me to take her picture and yeah, my heart melted into a puddle of melted snowflakes in an instant and does again, looking at this. A few advent calendar reveals! Pretty yarn, spiced hot chocolate from Treehouse Chocolate (from Portland) and handmade vanilla marshmallows from Lil' Miss Marshmallow (also from Portland), silver-plated stitch markers with tiny beads (made by me). Andy and I also made beeswax-(from Portland! )-and-soy-(not from Portland) candles with clary sage and juniper essential oil. I hope everyone loved these things as much as we loved making them and putting them all together. Yesterday Andy and I made our very first batch of cold-process soap and it was thrilling and exciting. It really was. We had a blast. I have plans to include soap in my upcoming Secret Garden project boxes if I can get good enough at it. We used the Creamy Shea Butter Bastille Soap recipe from Simple & Natural Soapmaking by Jan Berry. I scented it with Raspberry Jam fragrance oil, colored part of it with purple Brazilian clay, both from Brambleberry. I decorated it with blackberry seeds and tiny heather flowers. I'll let you know how it turns out in six weeks. My first bars that I made at the class I took at OMSI are almost ready to use. I can't wait. I've been on the fence about using fragrance oils, even only the phthalate-free ones, instead of essential oils but I think from now on I'm only going to use essential oils. Here is an interesting discussion about the pros and cons of both. Thoughts? Do you have strong feelings about this? I didn't think I did but I guess I might. But what to do when you want something to smell like blackberry and there’s no such thing as blackberry essential oil? First-world problem. But I find all of the soapmaking stuff intensely interesting. It kind of reminds me of learning to throw pots and then glaze and fire them. So. Many. Options. For what to make. And when it turns out how you planned it feels like a total miracle. This soap did not turn out like I planned and in some ways that was the most thrilling part. Much more soap experimenting to come. I'm really excited. Oh. My goodness. Has any child in the history of the free world ever blown out more candles for her third birthday? The cakes (and creme brulee, and chocolate mousse) just kept on coming. Wow. I think she thinks her birthday is a week-long national holiday. I think so too. We did so much stuff. I took so many pictures that they all got out of order, and I can hardly remember which days were what. Man, it was fun. We went to Sunday lunch at Jake's Grill with Andy's parents, who flew back to Chicago on Tuesday. Andy gave her the incredible crocheted squirrel from this pattern (his name is Marty, and he has his own birch-bark-sided house, with lights; the man is a crocheting genius) and the five crocheted acorns he spent all summer making. I gave her her quilt. We made breakfasts (both felt [cookies for breakfast] and real [pancakes]) and drove out to Multnomah Falls and its lodge for lunch. The day was silly gorgeous, the night filled with cake and candlelight. And suddenly my sweet baby is a little girl. The house is recovering, and I've spent almost every lazy minute crocheting a blanket myself. Outside the windows the leaves fall and fall and fall, and the sky is more gray now on more days than it was a week ago. I've taken hundreds of pictures in the past week, and we've driven a zig-zagging spider web from one corner of town to the other, doing stuff. Autumn is short and so special now. It's dark after dinner, but I keep the window behind the sofa wide open in the evening, and sit with tea in the my flannel nightgown under a little comforter, and listen to the leaves rustling outside. Then I close the windows tight, and pull the blinds and close them, too, and we snuggle in. It was my birthday on Wednesday and it was one of the best days I've ever had. Super quiet, nothing special, and yet everything was. Andy had the day off. We got breakfast at Besaw's (my favorite) and then ordered pizza and salad for dinner so no one had to fuss. Amelia napped on the sofa between the two of us for most of the afternoon. We played the Music and Lyrics soundtrack all day and Andy made me a birthday cake — apparently, the first cake he's ever baked all by himself. I asked him how he came up with the inspiration for his design and he said, "I looked at it, and I thought, 'There's nothing on there,' and then I saw those [blueberries] in there [fridge]." Oh, what a weekend it was. Amelia's little party was truly wonderful. She had such an awesome time, and so did we. Yesterday was her actual birthday, and the three of us drove out along the old highway to Multnomah Falls for lunch, then came home and made lasagna and had cupcakes for dinner. She insisted on wearing her party hat at all times. It was a perfect day (except for the couple of times she snapped the elastic from the hat against her cheek and started bawling). She went to bed an hour or so past her bedtime, and had no nap all day. She is a partier!!! So many toys, so many beautiful presents from everyone. Andy and I worked on ours for most of the summer — that's turning into such a sweet tradition for us. Andy's mermaid (from this pattern) — it was an epic experience. He worked on it every lunch hour for two months, and pretty much every waking free hour he was home. I tried to help him with a little bit of it and the hook was so small and the yarn so shreddy I seriously thought I was going to scream every time I picked it up. I truly don't know how he did it. He also made her a crocheted Clover doll. He is incredible. The mermaid's name is Ethel Shirley. She'll get her hat and her life-ring for Christmas. :) The doll I got for her was one I'd been coveting for years (from Happy to See You) — major splurge, couldn't resist. I made the beddy-bye-basket from this pattern (more or less, I had to add a lot more rounds because my yarn was thinner), her dress from this pattern, her nightgown from this pattern, and her sweater from here. I made the pillows and mattress and little quilt for the basket just out of some little pieces of fabric and trim that I had. Naturally, she is vaguely indifferent to both of our dolls. Naturally, Andy and I both prop each of our dolls up in front of her several thousand times a day. "I think she likes mine better." "No, she likes mine better." "No, mine." Etc. Her birthday dress and pinafore I made from a 1972 Simplicity pattern, #5277. I used a brown vintage calico I had, and some Liberty Betsy Ann in gray for the pinafore. I have to take pictures of the totally rad play food my sister Susie made for Amelia. It's incredible, and I will find out where she got the patterns, too. She also received some other really excellent presents I will photograph, too. I had the best time over the past few weeks gathering ideas for her party. The balloon/lantern collection is ubiquitous, but oh boy did it please a two-year-old who went out for a walk with her grandma and came home to find it suddenly and magically floating above the dining-room table on Friday afternoon. That was cool. Andy and I made it together, and it was so much fun to do. Once it was up we decided it needed something distinctly "2"ish. He cut the number out of a thick piece of styrofoam, and then I covered the edges with fabric tape and the front and back with glued-on fabric (I just traced the styrofoam number and cut out the fabric — super easy). Her cake I copied from this adorable cake that I just couldn't get out of my mind (I think I pinned it ages ago). I used this cake recipe and my mom's frosting recipe (I call it Cloudburst Frosting). One of the best parts of the day was the rousing rendition of "Happy Birthday to You" sung by all of us just before she blew out her candles — it really sounded like a chorus to me; it was truly awesome — and she looked around in complete wonder and delight at this big, bustling, beautiful family, fabulously doubled in size with her amazing birthfamily. All love. We are all just so blessed in this. I also loved watching her feed her little deer some coffee out of a wee teacup after the party as we sat quietly together and played and talked. Oh, how I love it all. I absolutely love it. Two. The best two years ever. Darling, wonderful, greatest girl. I love you so. s o m e o n e is having a little birthday party tomorrow. Someone is turning two! My dearest darling, already two. Preparations — and present making and finishing — are seriously underway. Details to come. But later! Right now it's bake, wrap, sew, fuss, fiddle, blow up balloons. My very favorite things to do. Oh, girl. I just love you more than I can say. The weather here has been very cold and very rainy and very gray and very dim this past week. Every night I've been piling several quilts on top of me and my sofa-seat and knitting, knitting, knitting, or taking warm baths by candlelight in the afternoon with my girl, who lounges in my lap and lets me pour warm water over her for an hour; we turn the hot tap a few times because we sit for so long it gets too cold. The swimming pool is supposed to open next week and I simply can't imagine this. A lonely, empty pool, and us Portlanders at home in the steamy bathtub. So the midsummer festival felt more like late spring, with daisies and dancing girls and our college friends (and how lucky we are to have them here, thousands of miles away from where we all went to college!). Last year I made Amelia a baby bunad (a traditional Norwegian folk dress; hers was inspired by the beautiful dresses of the Dovre region of Norway, where her birthfather's family is from). This year I just happened to find this little red calico dress at the resale shop and it fit her perfectly. It is a handmade dress, too, so I couldn't resist. I planned to make her a new Norwegian dress every year so I'll just have to start planning for Christmas because I think little red will be too small by then. Super cute princess-seamed pattern, though. I love princess-seamed dresses. You don't see them too much lately (early '80s — I'm just sayin'!). We had such a nice Father's Day, home all day alone together, cooking and playing. It was just a perfect day with my loves. I made a Dutch baby pancake and scrambled eggs with onions and mushrooms for Andy for breakfast. He made an awesome — possibly his best one ever — stuffed pizza last night. His recipe is the Edwardo's Famous Stuffed Spinach Pizza from the book Pizza: More than 60 Recipes for Delicious Homemade Pizza. If you aren't sure what Chicago stuffed pizza is, I will tell you: Think of an actual double-crust pie. There's a crust on the bottom, and then inside is all of the mozzarella cheese and a ton of fresh spinach. You pack it in. Then there's another crust on the top, and you crimp up the edges, just like with a pie. And on top of this top crust you add a light layer of a lovely, chunky, light tomato-and-garlic sauce, and then just a bit of sprinkled parmesan cheese. The whole thing is a massive concoction. You bake it in a cheesecake pan (I waitressed at Geppetto's in Oak Park after college, and we had special springform pans for our pizzas there, larger and shallower than a typical cheesecake pan; I need to look for one because I think it would help our crust thin out a bit). It weighs — actually, I have no idea how much it weighs, but a lot! The recipe in this book really does taste so much like Edwardo's pizza (which I liked better than Geppetto's, or even Gino's [Chicagoans, you know all these, right?]). Andy makes this about once a year and it is one of my favorite things. I love it, and it tastes like home. I also made the Bangkok peanut ice cream from my sister's recipe and that was very delicious. Someone asked if this was a Jeni's recipe and I didn't know what that meant, so I looked it up and discovered that yes, it is! (And I am so getting her book.) I found a recipe online for the Bangkok peanut here. I thought it was really lovely — very subtle but with some texture and a bit of a kick from the cayenne pepper. Making ice cream has given me a whole new appreciation for buying ice cream. I have no idea where this ice cream thing I'm going through came from, really. I have really been enjoying it — and by the time it's time to eat it, you really only need to have the smallest of scoops to be happy. I have a lot of ice cream in my freezer. Which makes one feels rather secure. So that's nice. Today Amelia and I are going to go to the fabric store. I need some skirts. I have a lot of fabric in my stash but it's all small amounts. I think we'll go to Knittin' Kitten tomorrow and look for '80s calicoes, too. Rainy-day ways: Walking, walking (in any kind of weather). Every morning, we are out, rain or shine. It's quiet, and the birds are singing. The robins hop around in the squelching grass, looking for breakfast. The wind blows the rain from the dripping tree branches, and everything's soaked. It's cold and quiet. You can hear the wind. It won't really be warm for a while, though compared to the rest of the pitiable, winter-locked country, we're balmy and flourescent here. We talk as we walk or sometimes she sleeps, only to wake at the bakery where we frequently have our breakfast (chai, toast, blueberries). She sits in the high chair, watching all the people, occasionally stopping to munch while she quietly watches. She comments: "Uh oh!" if a dish falls. "Hi!" to every and all. "Da!" and pointing at every pendant lamp (there are many — now I notice them everywhere we go, because she does). Signing for "more" (put your fingertips together) breakfast. I drink tea and read my book (my gosh, I had to put down The Little Stranger! Right after the party scene [i.e. : not very far in!]. I was so scared I couldn't continue. You warned me!) while she people-watches, turning her head to follow anyone moving, sometimes just sitting and looking like she's listening to and considering other peoples' conversations, chewing. She loves everything. I love everything with her. Sixteen months. I love this age. Just starting to talk. "Hi baa!" at the store, waving to a bin full of colorful rubber balls. Hi pendant lamp!!! Hi new glasses!!! Hi flower that smells like spring!!! I clip a sprig of daphne to put in a buttonhole on my shirt every morning. She brings me her scarf, her boots. I put them on her and she wears them around the house after we get home. Now: Bobby and Bibby. The deep-sea diver and the squid. Crocheted by DADDY. Who is also writing an album called The Bobby and Bibby Show, a variety show featuring original songs by every one of the most-loved stuffed animals in the house. Bobby, Bibby, Nighty Knight McNye-t'aghin, Mr. C, Heather, Margot, and Billie. So far. The man is amazing. My favorite part of summer is now, I think, when everything is still green and plump and hasn't been frizzled to a hollow. Barbecues with old friends, and baby is crawling. We spend our time together walking, or I ride my bike on the sidewalk so we can go as far as we want without my foot getting angry. Up and down the streets, past house after house and garden after garden. This is my favorite thing. The winding. The talking. He says we can go anywhere — and as far as — I want. Ending up at a restaurant, the bead store (yep, working on a new ornament kit), a pie shop. On and on. Amelia is so game. Amelia goes everywhere, does everything, and takes it all in with this placid, happy-go-lucky way she has. There's a sparkle in her eyes, but she is mellow yellow. There are no moments where I do not marvel at this quality. Knawing on her kitty, waving her foot up and down, she's watching. She shows me her bottle cap, her little deer. I like it. I kiss it, her. We rub noses. I ride in front, zig-zagging, about to fall off going two miles an hour and trying not to crash into everyone's rose bushes. Mommy the goofball. Andy buys a guitar made out of a cigar box and puts it on top of the stroller. Can't resist playing it while he walks. We're the ragtag parade, carrying a ten-pound sweet-cream raspberry pie and a stolen daisy. By the way, brunch at the Woodsman was a delight in every possible way. I had pancakes and very strong coffee and I was about as happy as anyone's ever been about anything, I think. I told you I'd tell you about Amelia's midsummer dress. It was inspired by a traditional Norwegian bunad, or folk costume. Each region has its own style of dress. Amelia's birthfather is three-quarters Norwegian, and his family is from the Dovre region of Norway. The dovrebunader, like this one and this one, are just so gorgeous. I have always loved these, so I was ridiculously excited to make her her own baby version. I made the pattern by tracing the bodice pieces of one of her basic little dresses from H&M, and then added a skirt that was 10" long by 44" wide. For the embroidery, I used the traditional dandelion-like design on the dovrebunader, and then just chose two other random designs from one of my clip art books. I traced everything onto copy paper and made a copy onto a special paper called Transfer-Eze. This stuff is VERY COOL. When you peel the top (printed) layer of the paper off of the heavy paper behind it, the top layer has a sticky backing. 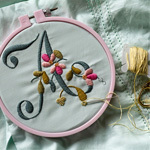 You press that smoothly to your fabric, then hoop it, and embroider away, right through the Transfer-Eze. 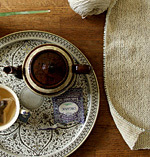 (See the photo of my embroidery-in-progress in this post.) When I finished the embroidery, I cut out the bodice (adding a seam allowance) and then soaked the whole thing in cool water for just a few minutes. The Transfer-Eze dissolved and disappeared without any problem at all. It was wonderful to use, especially since transfering is kind of a pain, especially on dark colored fabrics. This was my first time using this and I will definitely use it again. The only thing I noticed is that my hand and fingers were a little bit sore after I worked these pieces; you do have to push the needle a bit harder as you stitch, but it's not too bad. I was doing a lot of satin stitch in a pretty short span of time. I haven't really looked into who manufactures this product but maybe I will try to carry it in my web shop because it is pretty awesome. I'll let you know if I do. Anyway, I thought the little dress came out very pretty and it was really cool to make something by pulling together parts and pieces of inspiration. I also finished her midsummer sweater, and just have to put the buttons on. I think this is the first time I've ever done anything in reverse stockinette. Kinda cute. I think the yoke looks too deep, but maybe I'm wrong. I'll put the buttons (covered, I think, in Liberty lawn) on today and try it on her and see. It's cold and chilly today, so this will be good. In our yard the rose mallow is blooming, and the hydrangeas are just starting. The apple tree had three tiny green apples but they all fell off already. We built a little teepee (using this tutorial — really easy, really fast, really inexpensive) on Saturday afternoon when it was still sunny and gorgeous. She played in it for a while, though it got kind of hot; there was no breeze, especially in the teepee. After Amelia went to bed, I sat out in the yard and ate pie and watched the darkness arrive and pretty much became infatuated with the teepee at dusk. So far we haven't really used our backyard lights that much because it stays light so late right now, and I can't stay awake! But I stayed out Saturday night and it was worth it. Oh, how I do love a good ambient light source!!! It's sooooo romantic back there now. We had the lights done by this company. I basically told them what I wanted — two strands of light bulbs crossing over the seating area, hardwired into a dimmer switch on the garage wall — and they did the whole thing (even more romantic). I don't fool around with electricity, and I knew we wanted this to be permanent. Neither do I have the details about the cord because Chris the electrician provided that, but it was twisted black and brown, and what I liked about it was that he was able to put the lights into it only and exactly where we wanted them — right over the chairs, and not down the entire length of the cord as they stretch from the corners of the garage to the pergola thing, and then across to the fence (they added a little 2" x 2" board so the cord would connect at the right height). The bulbs are 40 watt clear appliance bulbs. The dimmer is fantastic. I'm really pleased with how this came out. Now we just need to drink some coffee after dinner so I can stay awake and enjoy it. Oh, and the other outdoor wicker pendant we have over the table we've had for several years, and it just plugs into an extension cord. I think it's like this one. I did wind up ordering a battery-powered lantern for the teepee, too. What else. I'm playing catch up today. I sincerely apologize to anyone who is waiting for me to answer an email. I am not good at this and the email just keeps piling up and up. Wimbledon starts today. Yippee! Does anyone know the name of that little daisy-like plant (feverfew — thank you! ), and the pink frothy one (spirea — thanks!)? Those were out in the neighborhood somewhere, but I'd love to plant both of them. Pretty. ***My tablecloth is from Powell's Books for Cooks; the teepee cover cloth is from eBay or Etsy; our bedding is from Pottery Barn; I made my skirt several years ago from cotton calico (don't know the name of it — I'm sorry); and I think the pillow cover was from Pottery Barn a few years ago, too. In the now-quiet house, the animals appear again, venturing back out into the center of the spaces. After a weekend of the most beautiful weather I've even seen in my entire life, yesterday dawned cloudy and cool, a welcome margin of gray into which we decided to fit some spring cleaning. I opened the newspaper and was excited to see that a recipe for pizza inspired by one I'd made last spring was included in an article about asparagus and pizza (thanks Deena!). We cleaned the fridge, got some groceries, made some dough, went to the lumber store to buy some cedar boards for our new raised beds, went back to the store to get more boards (naturally, we can't count), and spent the day puttering happily. Andy took the old roses out of the parkway (sorry old roses, but I know you were unhappy) and built one of the beds. There will be three total, each 4' x 8'. We'll plant vegetables and flowers. It's the only real sunny spot we have. Half of our neighbors came by while Andy was out there, one by one offering opinions and advice. Kind of funny. We just smile and do our thing. Whatever I dream up, he'll figure out how to make it work. I bring the plan (and the pizza); as long as he has his playlist, his puppers, and a decent IPA, he's off and running. I sit on the steps with a sketch pad and seed catalog, and study the light. Tulips blooming. Waylon Jennings. Potatoes, eggplant, lettuce, peas. Hi everybody! It's Andy again! Woot woot. That's right. Ready for anything, bring it on. I opened a kit, got my nice new scissors and hoop. Looked at the floss for a good long while, feeling good. Then I started separating the floss. I will admit that I did not properly allocate time for this. This seemed daunting. I started looking more closely at the flosses. What makes something tiger's eye compared to dirt road? Or bullfrog vs. hosta. (These are the color names.) At first glance I was like "nothing". But after separating them all I could TOTALLY TELL!! Oh, you noticed. These aren't Alicia's pictures. I took them all with my phone and then had to crop them from verticals to horizontals. Sorry bout that. So with my arsenal of floss, I was ready to sit down and start. I read Alicia's cross stitch tutorial again (it told me to read it in the instructions). Yea yea yea. Tie a knot in the back who cares count out where the next motif starts. I got this. Easy. Make an x. Make an x next to it. Yea. One two three four five six... wait five six... wait FOUR five six... What the. Maybe I just messed up. Start again. Four five six seven... I can't see it this. Go back to the tutorial. Tie a knot in the back if you want, count, yea yea yea. Got it. Yes, I read the instructions. Oh now I'm cookin with gas. Turn up the music! Looking at the grid. Finding that the holes are HUGE. Improvising from lower left to upper right first then going upper right to lower left. Yea that's right, I said it. Honey badger don't care. Mayday!! Mayday!! What happened? Oh. I just went too far. Back it out. No biggie. Back on track. Hey look, in the background it's Nanny Katie putting together kits. Is she stuffing yours right now? Also, notice the thumb. Yes, I will go trim my nails. Right now... BRB. Hi. I'm back. Look at that thing! He looks quite proud, going about his business. Don't you think? I know how he feels, cuz I just made my first "cross stitch motif". Which brings us to the final stage. Let's call it Accomplished. Did it! Feeling competent and good. I totally made that! !